If you would like to choose from a selection of property for sale in Granados de Banus, Marbella, Spain please look over our listings. We have a selection of apartments available in this well located real estate development next to Puerto Banus. 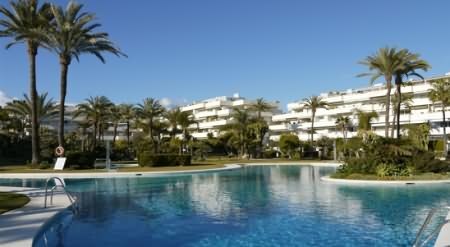 A frontline beach complex, it is situated on the eastern side of the leisure port of Puerto Banus. From your apartment you are less than 5 minutes walking distance from all of the designer shops, restaurants, trendy bars & beach bars that are located in the world famous Puerto Banus. A beautiful urbanization it has all the services that you would expect from a top quality property development. You will find 24 hour security, extensive landscaped tropical gardens and views over the Mediterranean sea. There are 2 resort-style swimming pools one of which is heated and the other indoor. You have direct access to the promenade as well as the beach from the development. There are courtesy parking spaces and a prestigious social club with restaurant, bar, terraces, indoor heated pool, gymnasium, saunas, steam room, Jacuzzi, showers (for ladies and gentlemen separated), etc. The Granados de Banus development has 24 hour security and is fully fenced. It is ideal for those that are looking to live in an exclusive luxury frontline beach complex.